helping them communicate their message locally and nationally. 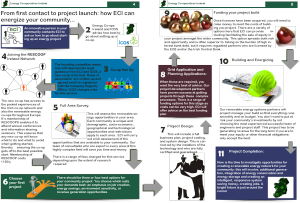 What help can we give your community group? Information on the legal requirements and benefits of creating a co-op. 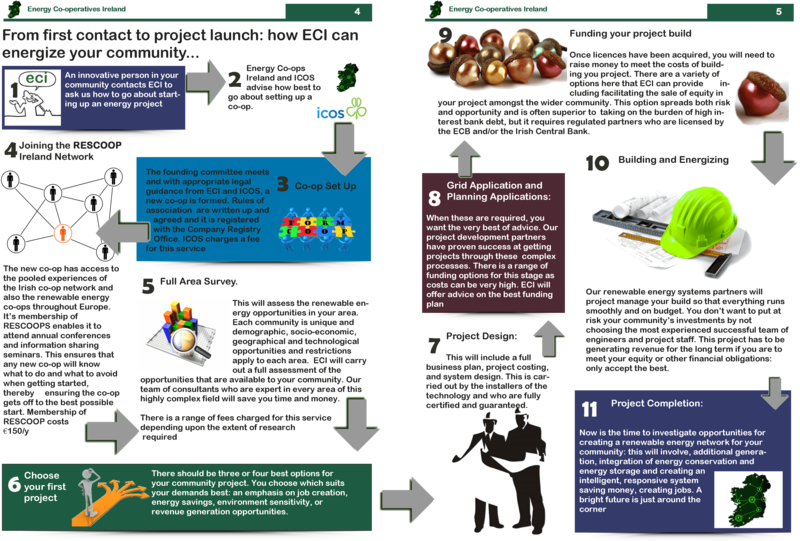 Access to relevant information concerning grants from organisations such as Enterprise Ireland and SEAI. Access to a rapidly growing network of renewable energy co-operatives. Help with to deal with local and national level policy makers. Advice on the renewable energy technologies best suited to your projects. Establishing a viable energy co-operative, if not done right, can be a complex and time-consuming enterprise. Many co-operatives become bogged-down in this work and fail to reach their full potential or worse they collapse, creating significant local ill-will. ECI with it’s partners in ICOS will assist you in establishing your co-op efficiently and quickly, putting it on a firm foundation, and giving it access to an EU-wide network. There are no fees for Energy Co-op Ireland’s assistance in co-op formation – we want to see the network grow and flourish. ICOS does charge a fee, for it’s legal advice in setting up your co-op. This includes Company Registration Fees, but is money well spent and will benefit you and your community far into the future. or email us at info@energyco-ops.ie. We’d be delighted to answer your queries and with the other established co-ops in our network help you on your journey towards a rewarding sustainable future.